This week we had our first chance to stand in the new addition! The exterior walls between the old and new spaces have been removed, but there is still a temporary wall supporting the existing roof that prevents us from seeing how the space will look and feel once it’s entirely open. We did admire the large new girder trusses that are supporting the old and new roofs though. 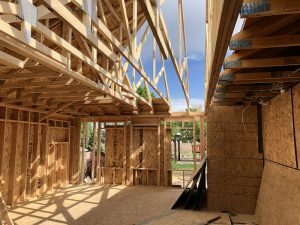 Sometimes during the framing stage homeowners decide they want to make adjustments. One of the advantages of having weekly team meetings is that all questions and ideas can be proactively discussed and everyone on the team can weigh in with thoughts, pros, and cons. In this case, Marisa decided she wanted a little more space in one of the new basement bedrooms and a little less in an adjacent storage room. 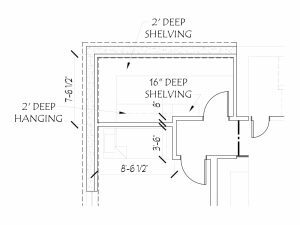 I adjusted the plans and recommended a location for the wall that would maximize the functionality of both spaces. All of this happened before anything had been framed, so nothing will have to be reworked in order to give her exactly what she wants!